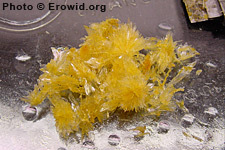 DMT is a powerful, visual psychedelic which produces short-acting effects when smoked. It is used orally in combination with an MAOI, as in ayahuasca brews. It is naturally produced in the human body and by many plants. Can DMT be made from soap and balsamic vinegar? How is Anadenanthera used and what is the dosage? Is there a psychedelic produced naturally by the brain? Is DMT produced in the human brain? Tongues of Divinity, by C.D.B.